A year ago, Daniel* made the decision to leave his country. Tragically, his wife Ana contracted Zika in her third month of pregnancy and their third child was born with microcephaly, an irreversible medical condition that requires medication that Daniel could not find in Venezuela. To become infected with Zika while pregnant sounds terrifying enough. But becoming infected with Zika in a country where it is impossible to find the right treatment is devastating. Daniel knew he had to leave Venezuela to save the life of his son, Juan. Not only his wife's medical condition, but the country’s precarious economic conditions pushed Daniel to emigrate to Colombia in search of better living conditions. After a day of travel, he crossed the border with hopes of getting a job, achieving economic stability and bringing his family as soon as possible. Migration checkpoint in Cúcuta, a border town where most Venezuelan immigrants enter Colombia. "We came from Venezuela because there were no antibiotics for the baby or the medicines he needed for his illness. We did not find diapers and the food is very scarce," Daniel says with a hint of sadness in his voice. "I am not leaving Colombia, for what? There is nothing in Venezuela. That already got worse,” he says. His desperation to send money home forced him to resort to smuggling. He buys malt beverages in Venezuela to sell them on the streets of Cúcuta, a city on the Colombian border. He brings them in via illegal border crossings, controlled by groups that force him to pay. Daniel’s border crossing includes the Táchira River, which separates the two countries. He risks his life daily to complete this trip. The sale of beverages allows him to earn $50 per month, very little to cover his family’s basic needs, but much more compared to the monthly dollar he received in his country. "At least here we have enough for rice and flour," says Daniel, "and we have the Church that also helps us with a midday meal." When he arrived in Cúcuta, Daniel slept on the streets for 15 days because he had no money and did not know anyone. He begged for money, and with what he collected he soon began to sell beverages on the street. The money he earned had to be sent to Venezuela to support his wife and three children. After two months of making daily crossings to selling beverages, Daniel sold his house in Venezuela, so he could bring his family. With the proceeds, he managed to rent a room for everyone and found the support of the Catholic Church through the shelter Divina Providencia, or Divine Providence, which provides them with medical care and food. "Here we have our food; a lot of the time I do not go in, but my wife and children eat," he says. A year ago, the Catholic Church opened this shelter with the purpose of responding to the humanitarian crisis of Venezuelans arriving in Cúcuta. With the support of Church groups from the city's parishes, 800 volunteers take turns during the week to distribute 2,000 breakfasts and lunches each day. During its first year of service, this house has delivered more than 450,000 food rations, thanks to the help of donors from the city and Caritas Colombiana. The Church also provides temporary shelter in the Diocesan Migration Center, which, during 2017, received more than 600 Venezuelans. 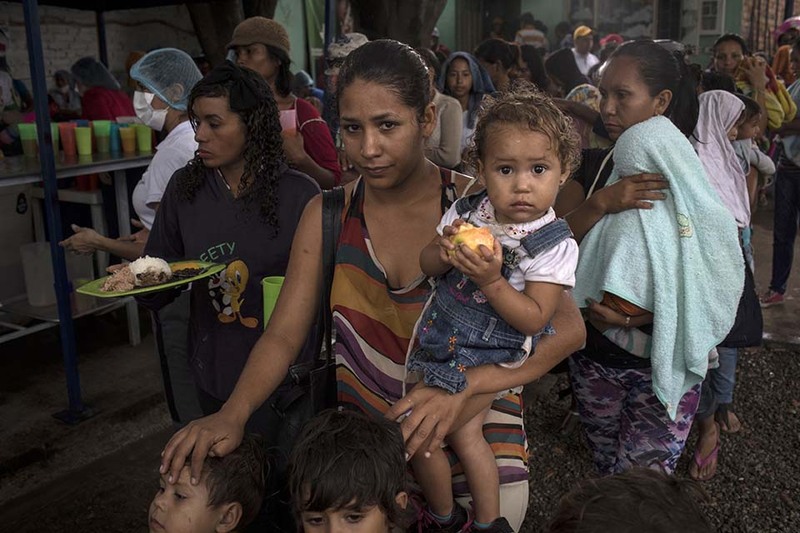 Women and children stand in line at Divina Providencia, a shelter offering people free meals and basic medical aid in Cúcuta. Father José David Cañas Pérez, the director of the shelter, explains the growing migratory flow as a phenomenon that has happened in waves. According to the priest, Venezuelans with more economic resources migrated at the beginning. They came to other countries legally and managed to rebuild their lives more easily. Now the poorest are doing it and doing so in very precarious conditions: without money and without identification documents. "Right now, Venezuela’s most poor and vulnerable are the ones who are coming, and they do not have the means to pay for a passport, nor do they have the means to buy an airline ticket to be able to leave. There are also people who arrive here and return, because they have no way to eat. They come in the morning, they look for food, medicines, and they come back because it is still cheap to stay there," he says. Daniel and his family continue to live in Cúcuta. They have managed to cope with his son's condition, thanks to the support of the shelter. Every day they receive two meals and medical attention for their baby. For this family, life takes place between the small room where they live, the streets of Cúcuta selling whatever they can and Divina Providencia. They hope that one day their country will find the economic and political stability that will allow them to return. 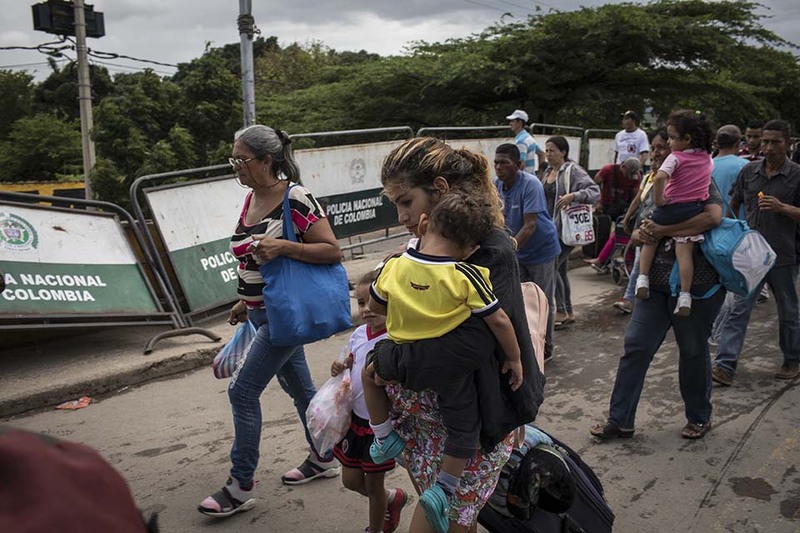 According to Immigration Colombia, more than 40,000 Venezuelan immigrants cross the border daily into Colombia. Currently, more than one million remain in the country and more than 200,000 are transit migrants, whose goal is to reach Ecuador, Peru and Chile. The poorest make the crossing by walking more than 2,000 miles to reach Peru or Chile. They do it without water or food. Drifting, they walk and trust that during their journey people of goodwill will provide them with some food. When the night comes, they look for any place to sleep and the next morning they continue their arduous walk. Peru is one of the most desired destinations because the country’s immigration laws allow them to work legally there. Catholic Relief Services is supporting the work of Caritas in Venezuela, Colombia, Brazil, Peru and Ecuador to respond to the Venezuelan humanitarian emergency, with lifesaving activities in malnutrition monitoring, health, legal and psychosocial protection, shelter, community kitchens, multipurpose cash and water, sanitation and hygiene programs. *The name was changed to protect privacy.